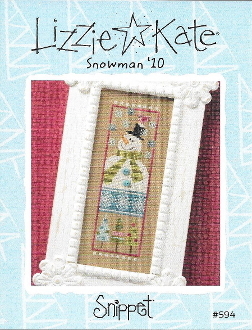 An adorable Snowman design with fun, wintry colors. Accent with the enclosed 2 hand-dyed teal buttons and sparkly white crystal beads. Design size: 2.25" x 7.5". Model stitched on 28 count Dirty Cashel Linen 2 over 2 (not included). Stitch count: 33w x 107h. Instructions given for Weeks Dye Works/Crescent/Sampler threads with conversions given for DMC embroidery threads (not included). Chart includes two teal buttons and tiny white crystal beads.